Guild Wars 2's first expansion, Heart of Thorns, is out October 23, so it's the perfect time I guess for ArenaNet to release a launch trailer. The above might be the most premature launch trailer I've seen, showing a big battle between some warrior types and an enormous plant that wants to give them a crushing hug. If you've ever had to deal with bindweed in your garden or allotment, you'll surely understand their plight. Guild Wars 2, if you hadn't noticed, is now free, while Heart of Thorns will ask for a one-off payment when it comes out in a few weeks. The expansion, among other things, adds raids to the MMO, and they'll be a bit different to the raids featured in other massively multiplayer gardening games. ArenaNet has been busy on the announcement front. It's also revealed that Heart of Thorns' final beta event will take place next weekend, from October 2 until the 4th. 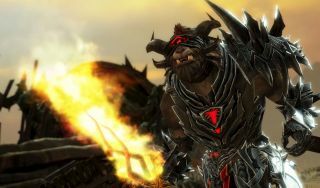 Oh, and it's also introduced the ArenaNet Partner Program, which aims to "support content creators" making Guild Wars-related YouTube videos, streaming, blogging, making fan art or whatnot. Bloody hell, ArenaNet has revealed the Ranger's new elite specialization too. Say hello to the Druid, who's able to attune with the land, uncover helpful ancient glyphs, and enhance their allies via staff skills. "As a longtime ally of nature, the ranger can now channel the strength of Tyria itself after tapping into the primal forces of the Maguuma jungle."